Overcast with rain showers at times. High 56F. Winds S at 10 to 15 mph. Chance of rain 70%..
Showers this evening becoming a steady light rain overnight. Low 49F. Winds SSW at 5 to 10 mph. Chance of rain 60%. Mike Myers, the former fire chief in Portland, is heading to the coast for a new emergency management job in Cannon Beach. Mike Myers, the former Portland fire chief, will be Cannon Beach’s first emergency manager. The announcement came hours after news of Myers resignation broke Thursday, Jan. 3, in Portland. He joined Portland Fire & Rescue in July 2016 and was heralded for bringing modern business practices to the fire department. “I thank the employees of Portland Fire & Rescue for their hard work and support during my time here. This is a personal decision on my part. I love the coast and my wife has already moved there and it is my strong desire to join her,” Myers said in a statement. Myers has long had a passion for emergency management, starting with writing emergency medical plans in Las Vegas, where he was the fire chief for more than 26 years. While Myers saw the job in Cannon Beach when it was first posted six months ago, it “didn’t feel like the right time” to apply, he said. After being enamored with the beauty of the Oregon Coast, he and his wife decided a couple of months ago to buy a home in Gearhart. A few weeks later, he checked to see if the position was still open, found that it was, and submitted an application. He was offered the job earlier this week. The timing, however, raised some eyebrows in Portland. Myers announced his resignation the day after his new boss, Commissioner Jo Ann Hardesty, was sworn into office. Myers said the move has nothing to do with Hardesty, and the timing was a coincidence. 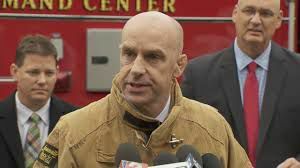 Myers was known for his “Blueprint for Success” plan in Portland, which aimed to equip the city’s firefighters with more skills to respond effectively to health emergencies like overdoses and mental health crises — calls that have become increasingly more common. He was also recognized for hiring the department’s first equity manager and for doing a complete revision to the employee discipline process. Cannon Beach created the full-time emergency manager position to restructure the way the city approaches emergency planning. The city had previously contracted with consultant Stacy Burr for emergency planning. “He’s extremely qualified and he’s excited about what we’re trying to do, and that’s to develop an emergency management program that involves everyone in the city,” City Manager Bruce St. Denis said. His first day will be Feb. 1. "I’m looking forward to helping the community build resilient and sustainable plans to protect residents and visitors alike."